There are some colors that shout the period when they were made. Think of fluorescent colors in the 60’s, avocado green, harvest gold, brown, and pumpkin in the 70’s, and those country colors of dusty rose, natural white, and that greyed blue of the early 80’s. Eventually most of these colors combination become fresh and new again but in the meantime they just end up looking dated. 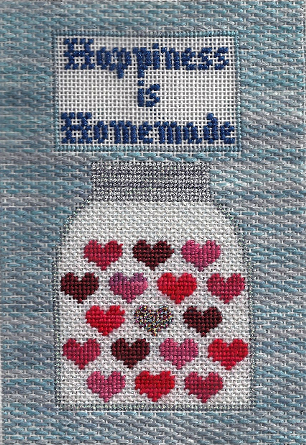 This can be a serious turn-off for making a needlepoint, especially one that will be a gift. I found myself in just this situation. I saw a charming canvas that is a perfect present on eBay and bought it. But when it arrived, although I love the design, the colors are those 80’s colors and if I stitch it that way it will look dated and dull. When you are faced with this problem, you need to update the color scheme to currently popular or classic colors. Virtually all color schemes, no matter the actual colors, are based on the standard color schemes, such as analogous or complementary. Once you know this you can change the colors to a similar scheme in different shades of the same colors. The scheme I had was unpainted canvas (i.e. natural), two shades of that greyed blue, a tarnished grey, and four shades of dusty rose. That’s red, white, and blue, definitely an easy scheme. Here are two ways to update it, Classic and Current. dusty rose became four shades of pink berry colors, similar in value but more saturated. I’m stitching in the current schem and so far it look fantastic! The picture above shows how the design looked when stitched with a similar, but current, color scheme.